Our Layout and Data Layout Controls can create the most sophisticated and complex UI structures – you can arrange hundreds of elements in a form or user control, split them into groups and tabs, persist and restore layouts. The introduction of vector skins brought with it a second innovation for our skinning engine: palettes. A palette is basically a skin for a skin. Element settings like border widths, sizes and visibility are stored in a skin, while color themes moved into palettes. This means you can have countless color variations of the same skin. DevExpress Reporting has excellent support for export formats, but some of them are better suited to the typical WYSIWYG-designed report than others. A little while ago we announced React Grid version 1.0. We talked about plans back then, and today we introduce version 1.1.0, the first minor update that contains the most requested features. In addition to SQL Server, MySql, PostgreSQL and SQLite, XPO for .NET Core & .NET Standard 2.0 supports ADO.NET provider 5.11+ for Firebird starting with v17.2.5. If you're interested in a faster PictureEdit, download and install the latest update. The next controls to get DirectX rendering will be TreeList and Chart, and we expect to release these updated versions in v18.1. Our official 2018 roadmap is now live for all active customers. You will need to login to our site, and then you can use the links below to review our plans for this year's two major release cycles. The Bootstrap team has officially released Bootstrap 4 and DevExpress Bootstrap controls for ASP.NET WebForms and ASP.NET Core support this latest release. In this blog post, we'll dive into the two seemingly similar libraries that both offer controls for ASP.NET MVC. We'll look at the differences, similarities, pros, cons, and consequences. Thanks to great feedback from our users, we've extended the capabilities of Logify so it can better meet the 24/7 application monitoring needs of customers. Our most recent release (v17.2) ships with three Visual Studio-inspired themes. 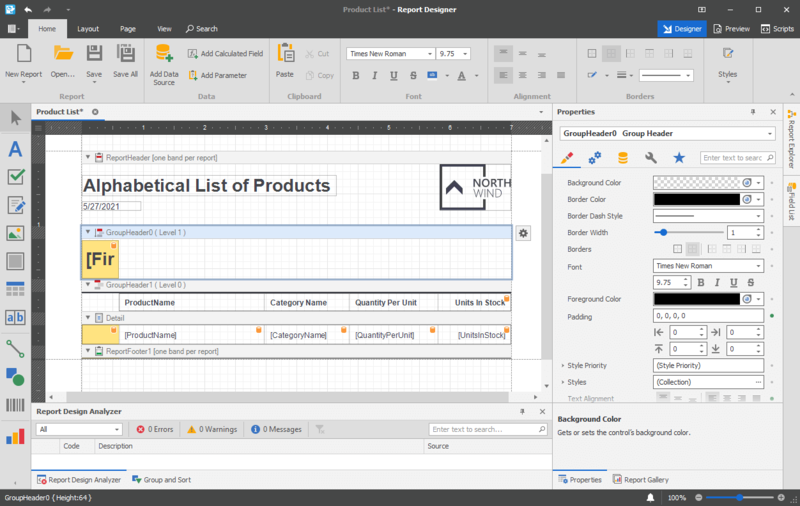 For those who prefer our Microsoft Office-inspired themes, v17.2 ships with a new Black option. When you download v17.2 and run our WinForms demos, you'll notice a new skin style: one that renders its elements using vector graphics. We are proud to announce the immediate availability of our newest release, DevExpress Universal v18.2. Built and optimized for desktop, web, and mobile developers alike, DevExpress Universal ships with over 600 individual products - all designed to empower today's enterprise and help software teams deliver high performance line-of-business apps that amaze. We are proud to announce the immediate availability of Logify, our 24/7 application monitoring and crash reporting service. Designed for small and large developer teams alike, Logify helps track runtime execution errors, recognize weaknesses within an app in real-time, and eliminate errors associated with traditional bug reporting processes. 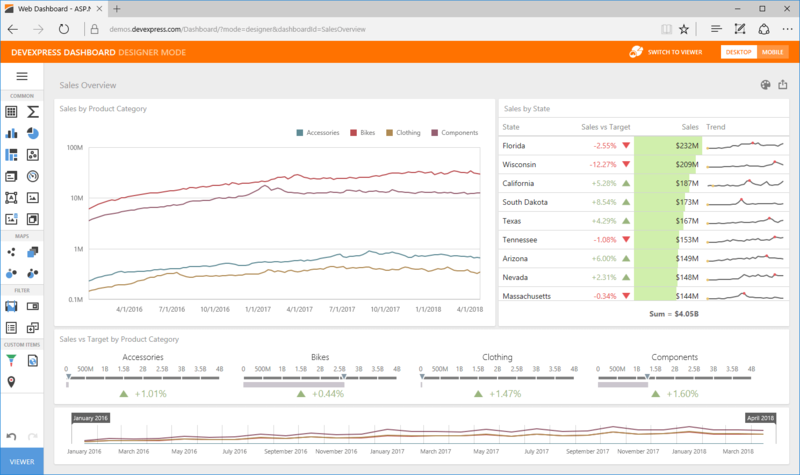 Deliver high-performance decision support systems and analytics dashboards across platforms and devices with our fully integrated suite of UI controls, reporting tools and dashboards. DevExpress Universal ships with everything you'll need to build your best, without limits or compromise. I have used DevExpress WPF in the past, and always been impressed with their support and the richness of their offer. Now, as I am venturing into developing my first web application, I first looked at a competitor because they provide a free license. But I gave up because their documentation is inadequate. So, I have tried DevExtreme, and managed to use it quickly and with much less effort. As a Manager of Technical Support Services for a former company, I know good customer service when I experience it. DevExpress Support is of the highest level. Issues are handled expediently. All the support resources appear to be highly knowledgeable, but beyond that they are all courteous and professional. I've also witnessed the issue escalation process which keeps the issue flowing to resolution. I have nothing but the highest praise for DevExpress Customer Support. We love the XAF's "Code It, Run It, Customize It before Lunch" slogan, and take great pride in our Smart (also based in XAF) slogan – Take a case from a customer, customize Smart, provide a solution, finish your work today. Thanks to DevExpress' eXpress Application Framework, I can sleep well at night knowing that my customers' needs are so fully met! I just wanted to let you know that your support is great. Not only that I am getting quick answers to all of my questions, your public ticketing system is so well organized and indexed by search engines that it is very easy to find ideas to solve my problems even without contacting you. We are very happy with DevExpress. The support team is amazing. All our question were answered within 12 hours. Even there is no solution out of the box, there is always an alternative way. This gives us the feeling that nothing is impossible. We are looking forward to program a lot more nice stuff with DevExpress. After 25 Years of professional windows development I have never seen a library like DevExpress. AWESOME! This great grid control is the best I've ever seen! An investment that makes happy! I would like to take the opportunity to compliment you and your colleagues at DevExpress Support. I have worked with many support organizations and your support really stands out: it is outstanding. I have mainly been in contact with you and Anatol and it is always a pleasure to work with you guys. Keep up the good work! Still discovering new and exciting possibilities while being a customer for 5+ years - best .NET developer tools on the planet. Thank you for another year of using your controls to make some great products for our customers. Can you please say thank you to all of your support staff. They do a fantastic job, so I hope you never cut back on this service. The experience I had with DevExpress is "top"! Outstanding support, very friendly interfaces and above all a marvellous framework to develop with. So far, it has been an extremely positive experience, I presume not due to change in the future! If you're looking for the fast road (with professional support) towards web-development ... don't look any further! DevExpress has it all! The DevExpress team already set the new standard in software service industry. For every ticket that I created, there is not even one of them answered late. I didn't hesitate to tell my colleagues about your products. The most invaluable third-party tool that we have. It has been selected to be our base controls since they're incredibly powerful, customizable and easy to implement. Saves us hundreds of hours in every project assigned to us. Thank you DevExpress for building one of the most powerful, feature rich control suites on the market. Your superior support staff is second to none! I can't even begin to measure the amount of time the controls have saved me. And to see the look on people's faces when they experience the controls first hand, is priceless! I would not have been able to produce such a comprehensive web application, 'ConversationalCRM', singlehandedly in the short timescale I had available without using the DexExpress tool set. DevExpress have allowed me to provide a fully-functional CRM, supporting marketing, sales and support activities to my end users. 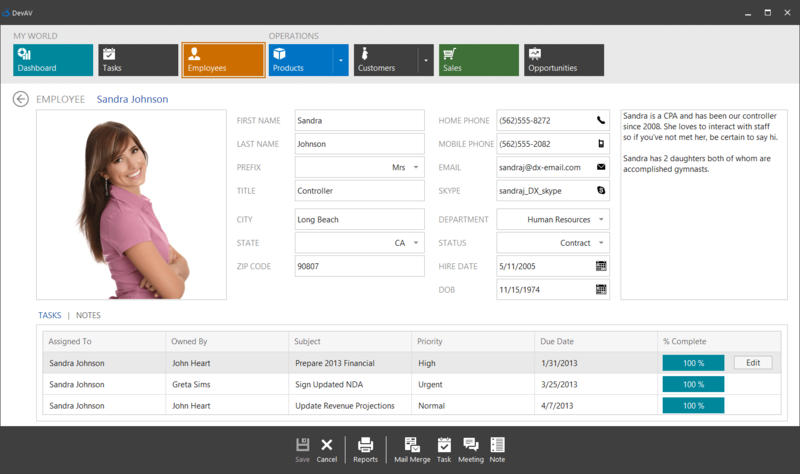 The CRM has full reporting, including User Report Templates (using the End-User Report Designer) and end-user designed Dashboards (using the Dashboard Designer). I believe the real power of XAF is your special way of handling the MVC pattern. Adding a property to a Business Object - no matter if doing it in code or with the Application Model Editor - all possible types of views can show the new values: Detail View, List View, Reports, Statistics, etc. This is really stunning and flabbergasts me every time I see it. You've really done a great job. To be honest I've developed something very similar in the past and used it now for a long time for my projects. But XAF is much more powerful and easier to use. Not to mention your great UI components. I'm really thrilled, I've been using this suite for a couple of months and it's really fantastic. Everything I was looking for in a product. The support is great, they help you in any situation by responding very quickly and very clearly. I am using the DevExpress WPF components since more than two years ago as part of a major project to refactor an existing software. My users are very happy and impressed with the new features that I was able to provide thanks to the advanced capabilities of the grid, report builder and map controls. Thanks to the whole team of DevExpress for their great product and the useful technical support! We use DevExpress components since 2007. Our 3-tier WinForm application uses the great capabilities of XtraGrid, XtraBars and other controls. Alternative web client is built on ASP.NET Grid. For our customers, it is very easy to use our applications, because it is intuitive. Thanks DevExpress for components we deliver to our customers, beautiful UI with charm. DevExpress has helped me since 2007. I purchased the Editors and XtraGrid first, and then expanded to include full subscription. Your tools are the best, and support has been top notch! DevExpress has made ProParts really come to life. Currently compiled with Delphi, the conversion to .NET is already underway and looking just as good. In addition, I've started the requested web site upgrade using ASP.NET controls, and the conversion is moving along smoothly. So yeah, I'm on both sides of the DevExpress fence with Delphi and .NET, but this is a case where you really get what you pay for. With the ever growing up-to-date DevExpress components and technologies, I could build the latest applications on multiple platforms with the top notch functionality, quality and reliability. We are using DevExpress components since day one we have started developing our software. We see DevExpress just as a member in our team, always responsive and producing great quality work. Keep up the good work and thanks for your continued support! DevExpress XAF and XPO, these are amazing stuff you can use to speed things up developing application, web or windows. What else you want to expect if someone can give you more time to do other things in life? Thank you for amazing components. 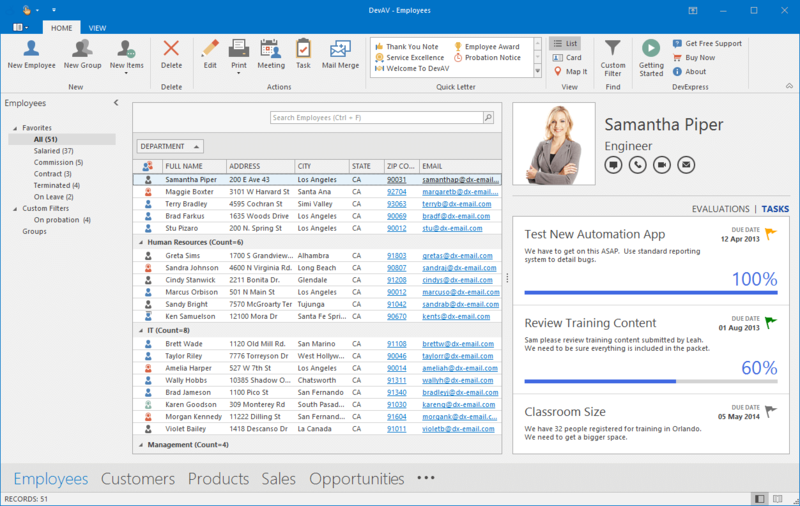 We are using the WinForms component and are planning to move to the Universal subscription later this year to utilize the DevExtreme and ASP.NET components. The components saved me a lots of time in the past while building quick data driven applications. In few words, you made my developing "green" because you save a lot of energy simplifying development and reduce the time my computer is on. Everything is done quicker than ever. Keep it up with your great suite, it saves me a lot of time, and also helps me to convince and impress my company.